It’s week eight and the West Lot Warriors are still taking the time to post blog content – which tells you that the ‘Cats are still winning! After every single Warrior picked the ‘Cats to fall at Nebraska last week, Clayton “Bigsby” Thorson looked like Taylor Martinez used to in Lincoln and led Northwestern to a gutsy two point win with some big runs. I also heard he went all Kirk Cousins after the game. Dean Lowry looked like an absolute animal with a school record six tackles for loss, and is starting to look like he’ll be one of the highest NFL draft picks from NU in recent memory. The ‘Cats moved back up to sixth in our WLW power rankings, third among the B1G West teams behind Iowa and Wisconsin. Speaking of Wisconsin, their quarterback went down with a concussion in last week’s game against Illinois, and the heavens opened up to deliver us a back-up QB with a name that only Aaron Sorkin could dream up – Bart Houston. Keanu Reeves might disagree, but that’s up there with Johnny Utah as one of the best QB names ever. Moms, dads and whoever develops the fake Madden player names take note – if you want your child to be a successful quarterback , simply give him a commonplace first name and a southern/western state/city last name (See Montana, Joe). Alas, Bart Houston didn’t live up to his epic name in an uneven performance at Illinois, but Wisconsin got the W. And with Joel Stave’s health improving, we may have to put Bart’s superstardom on hold for the moment. Over in the B1G East, Michigan State pulled out a deceiving 52-26 win over Indiana. Don’t be fooled, the Hoosiers were within one score of the Spartans late in this game before Big Green pulled out a few late touchdowns leading to a misleading blowout score. Michigan State has had some very close calls this season, but with Connor Cook at the helm they have the ability to win every game they play. Ohio State looked like Ohio State in a 49-7 dismantling of Rutgers, and remains firmly on top of our rankings. Lastly – shout out to Jerry Kill, the coach of Minnesota who retired today for health reasons. Kill seemed like a genuinely good guy, and the Warriors wish him the best. Ok actually lastly – I’m going to install a new segment this week, for the hell of it. We’ll call it Trent’s Top Four(s), and I’m going to rattle off my top four in a variety of categories. Oh how the mighty have fallen. A few weeks removed from being #3 in our prestigious WLW rankings, the ‘Cats are down to #8 this week after two straight deflating performances against Michigan and Iowa. But Northwestern fans can take heart – at least we’re still ahead of Illinois. All in all, this team has exceeded expectations so far – especially in the non conference portion of the schedule – so there’s reason for optimism. But it’s tough knowing that just two weeks ago the ‘Cats were sniffing the Top 10 in the AP poll. So goes the weight of expectation. Elsewhere in the Big Ten, Michigan and Michigan State played a snoozer in Ann Arbor, with Michigan State edging the Wolverines 27-23. JK – it was actually one of the best finishes I’ve ever seen live. The Spartan faithful need to come up with a solid nickname for what we witnessed, since that last play should go down in the annals of college football history with the likes of “The Stanford Band,” Flutie’s “Hail Mary,” and Auburn’s “Kick Six.” Many thought Michigan State was going to get run out of the Big House in a blowout, but my biggest takeaway from the game was that the Spartans are for real. They may have been lucky to win – but they were right there in the game the whole time. If you have a quarterback as quality as Connor Cook, you can do pretty darn well in the Big Ten. After a devastating loss, it’ll be interesting to see how Michigan responds for the remainder of the season. Lastly, let’s talk about Iowa. The Hawkeyes are in a very strange spot right now, sitting at 7-0 and likely to be the favorites in every game from here on out. That’s right, the most likely outcome is that the Iowa Hawkeyes will roll into the Big Ten title game at 12-0. I tend to think they will trip up somewhere along the way (at Indiana in two weeks, or at Nebraska the last week of the season), but we shall see. Iowa has an extremely easy schedule, so it’s hard to really gauge how good they actually are. But, if they can win out and can pull out a victory in the B1G title game, they have to be in the playoff – right? I look forward to betting heavily against the Hawkeyes in the first round against Baylor. Shout out to our Iowa friends Zak Bergman, Blake Yocom and Mike Parrott. Just like Zoolander, the ‘Cats are in a time of uncertainty. Week 5: Northwestern 27 Minnesota 0. Week 6: Northwestern 0 Michigan 38. I’ve never seen a team flip from being such a dominant force one week to getting so dominated the next. So who are we? Are we the team that made Minnesota (who put up 41 points last week) look silly for attempting to play something they called offense? Or are we the team that had so little offense against Michigan it was offensive to the fans? I’m going to cop out and say the answer is somewhere in the middle. The ‘Cats have established they can beat anybody left on the schedule, but they’ve also established they can lose to anyone left on the schedule. We’re not a great team, but we’re a pretty good one. Maybe Michigan is actually a top 5 team, and used the game against NU as their coming out party. With a HOMECOMING game this weekend against #17 Iowa (#4 in our WLW poll), Northwestern should find out a lot more about what they can do. For now, the ‘Cats sit at #5 in our rankings. Michigan has vaulted all the way up to number 2, with a game against Michigan State (number 3) up next this weekend. The round robin between those two teams and Ohio State will be very interesting to watch develop, and will likely decide the Big Ten champion as well as the Big Ten representative in the College Football Playoffs. Depending on how those three games shake out, there’s even a possibility that two B1G teams make the Playoffs. After the top four or five teams, it’s a sea of murky mediocrity. Record doesn’t really matter, with 4-2 Indiana ranked several spots behind 2-4 Nebraska (who keeps finding new ways to lose). The key is that these teams have just begun the Big Ten slate, so these next few weeks against stiffer competition will give us a much better read on where the teams stand. Before we move on to the rankings, here are a few fancy charts showing where the Warriors have ranked the Wildcats and the other B1G teams over the first six weeks. Let’s hope that purple line will tick back upwards after HOMECOMING this weekend. A rough outing for the ‘Cats last week against Ball State equals a drop in the B1G power rankings. But hey, at least we got that W. Northwestern has fallen to fourth in our WLW poll after being jumped by Wisconsin, and Michigan is hot on our heels with only two fewer points. Michigan looked awfully impressive last week with a beat down of BYU, and having only lost to a very good Utah team on the road thus far this year, the Fightin’ Harbaughs may be better than we thought. We didn’t learn too much else about the B1G last week, as many teams played lesser opponents. Maryland did get blown out by West Virginia, dropping the Terrapins perilously close to last in our rankings – but take heart Terrapin fans, you’re still ahead of Purdue. Things are seemingly starting to clear up, but with B1G season just about to officially start, much can change very quickly. The B1G West looks wide open at the moment, with Wisconsin, Nebraska, Iowa, Minnesota and the ‘Cats all in the mix. Northwestern is facing Minnesota this weekend, and Wisconsin is taking on Iowa – both of these games should tell us a lot about where the teams are at, and go a long ways towards deciding the division. At the moment it seems that a team is going to have to go either 7-1 or 6-2 in B1G play to come out of the West, since both Iowa and Wisconsin have very easy schedules from here on out. In addition to playing all the teams in the West, Iowa has crossover games against Maryland and Indiana; Wisconsin has crossover games against Maryland and Rutgers. That makes Northwestern’s games against the Hawkeyes and Badgers even more important – as those could be our only opportunities to make up ground. But let’s not get ahead of ourselves – if there’s anything I’ve learned from watching college football over the years, it’s that anyone can lose to anyone on a given Saturday. These are teenagers playing the game, not pros. As Maryland coach Randy Edsall said this week, ‘life is like a box of chocolates, you never know what you’re going to get.’ He may not have understood what the Forrest Gump quote meant when he said it, but you get the point. First things first – Minnesota this week. Let’s beat the Gophers. On to the rankings. 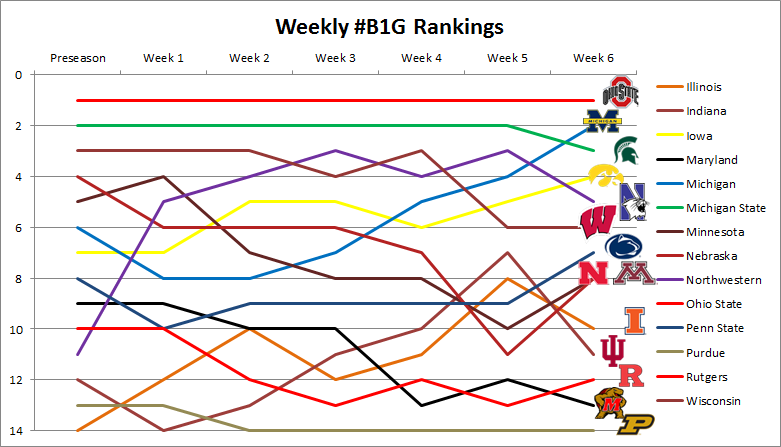 Three weeks are in the books, and the B1G power rankings continue to fluctuate. After Ohio State looked very human in a close home win against Northern Illinois, they’ve lost a few first place votes to Michigan State. The Spartans have gained ground in the “actual” rankings too – gaining some first place votes in both the AP and coaches polls this week. Our beloved ‘Cats have moved up a spot, narrowly slipping up past Wisconsin into third. After a road win in Durham on Saturday morning, Stanford put up 41 in a road win at USC, which makes the ‘Cats opening win against the Cardinal look that much more impressive. Our D looks pretty amazing, while the offense looks pretty atrocious. We’ll see how those story lines hold up as we enter conference play. Elsewhere in the B1G, Minnesota won a stinker against Kent St, Illinois got whupped at UNC, and Nebraska lost in OT at Miami. Iowa and Indiana remain undefeated, but it’s still too early to tell if the Hawkeyes and Hoosiers are for real. With that – on to the rankings. Another week is in the books, and we’re starting to learn more about our humble conference in America’s Heartland (which also has some rando East coast schools thrown in too). It seems the Big Ten has a dominant few teams at the top, a lot of mish-mosh in the middle, and then a dumpster fire going on in the bottom ranks. For every Michigan State win against a powerhouse in Oregon, there’s a Maryland getting blow out by Bowling Green, and a Rutgers falling to Washington State. But hey, at least we’re not the SEC. The ‘Cats continue to steadily rise up through the ranks, having still not given up a touchdown on the year. We’re holding opponents to an average three points per game, but the crazy thing is that’s not even the best in the B1G thus far. Illinois has given up only three points total thus far, albeit against very weak competition. Maybe with Coach Beckman gone, the Illini are revitalized and maybe sorta kinda competent. Here’s a random interesting fact – two Pac 12 Oregon teams traveled to Michigan last week for B1G games, and this week two Illinois teams are traveling to North Carolina for road ACC contests. Weird huh. There’s still a lot to learn about the pecking order of the B1G, and this weekend should help bring some more clarity. The Warriors are very divided on Nebraska, with one person ranking them as high as fourth, and another ranking them as low as ninth. With a road test at Miami this week, we should know much more about how the Huskers are looking this year. With that, let’s look at the rankings.